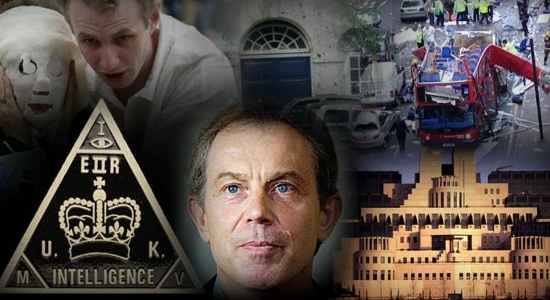 The show on the phony war on terror & London 7/7 bombings was broadcast July 7, 2010. 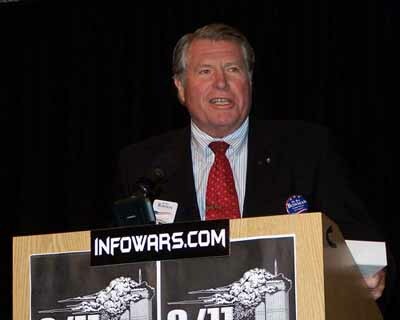 The show with Col. Bob Bowman was broadcast July 6, 2010. 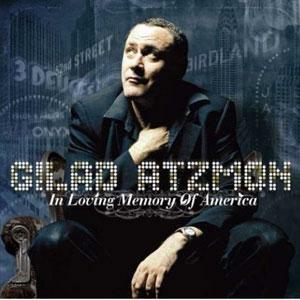 The show with Gilad Atzmon was broadcast July 5, 2010. Special 7/7 London Bombing Show Wednesday! Gilad Atzmon (Monday) and Dr. Robert Bowman (Tuesday)! On Wednesday, July 7th — the fifth anniversary of the London Tube bombings — you can hear these four authors exchange views on this and other provocative “New World Order” topics, what their tactics are, and what we can do about it. 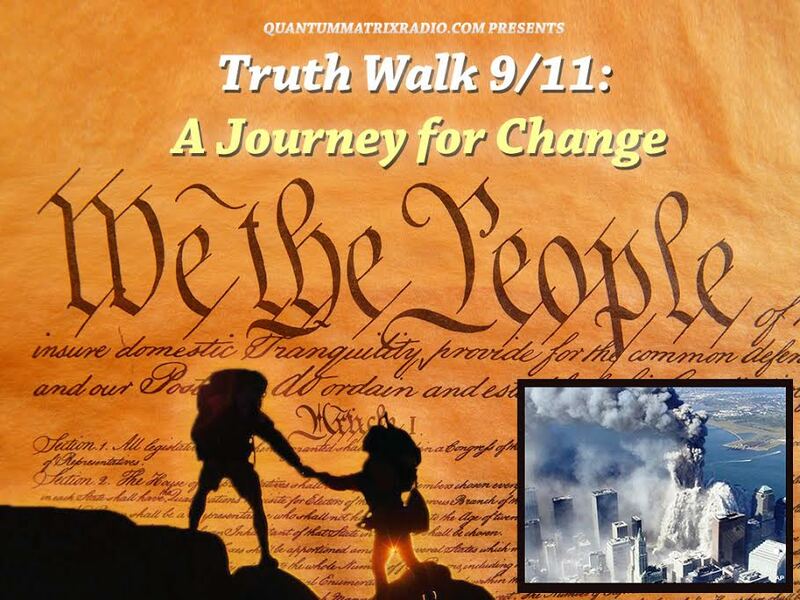 Can the 9/11 Truth movement carry on? What are countergangs, and how to take over the world with them? Dave Aossey is a third-generation Lebanese writer. When we asked his take on it, he said most people in the Middle East still believe in the American dream. If you ask them where they’d go if they could live anywhere they liked, they will say the United States. It’s not true that Arabs hate the US at all — on the contrary! David Livingstone is a Canadian Muslim writer. His views on it are more controversial: Islam has been thoroughly infiltrated by agents of the British empire and the Illuminati. They created the Saudis and Wahhabis, who use their oil money to foster two distortions of Islam. One is resigned to political or social injustice. The other spouts jihadist rhetoric. It’s all part of a long-term Clash of Civilizations planned by the empire, along the lines of the Three World Wars. 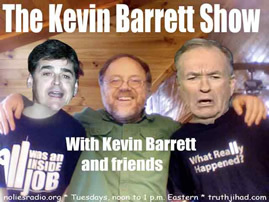 Monday and Tuesday I will be speaking with two of Planet Earth’s greatest patriots, Gilad Atzmon (Monday) and Col. Robert Bowman (Tuesday) on The Kevin Barrett Show. When you discover that your country has crossed the line and has become an enemy of humanity, what do you do? Gilad Atzmon, the guest on my special Monday show, gave up his Israeli citizenship, moved to the UK, and became possibly the most incisive critic of Zionism on the planet (as well as an acclaimed musician and novelist). He will be joining me, Ken O’Keefe, and Jim Fetzer at the upcoming London symposium Debunking the War on Terror on Wednesday, July 14th. Col. Bob Bowman, a decorated fighter pilot and Cal Tech rocket science Ph.D., stepped down from his position as head of the US Space Weapons Program and blew the whistle on it being a purely offensive — NOT defensive — program…and gave up a brilliant career path that might well have led to the Joint Chiefs and even the Oval Office. More recently, he has been blowing the whistle on 9/11 and the war and fascism it was designed to trigger. Dr. Bob is about to launch his 2010 tour of the USA. Meet the man who would be president if we had a real democracy or meritocracy — catch him on the Kevin Barrett show and/or at one of his tour stops! In their eloquent struggle to defend humanity against the evil that has taken over the lands of their birth, Gilad Atzmon and Dr. Bob Bowman (like last week’s guest Ken O’Keefe) have become true planetary patriots. May all of us be inspired by their example and follow in their footsteps. 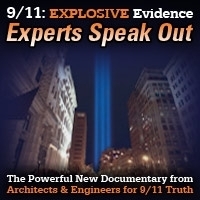 This entry was posted on Monday, July 5th, 2010 at 11:47 am	and is filed under 9/11, Anti-War, Disaster Capitalism, False Flag/Fake Terror, Freedom, Justice, Kevin Barrett, News, Protest, Torture, War Crimes. You can follow any responses to this entry through the RSS 2.0 feed.